I've never really been a huge breakfast fan...until now. What I thought were pancakes don't even hold a candle to what you can get here. See that huge plate of silver dollar pancakes above? Yeah, that was what came with our order of "three pancakes." I have absolutely no idea how that enormous platter qualifies as "three pancakes," and honestly, I couldn't care one bit. 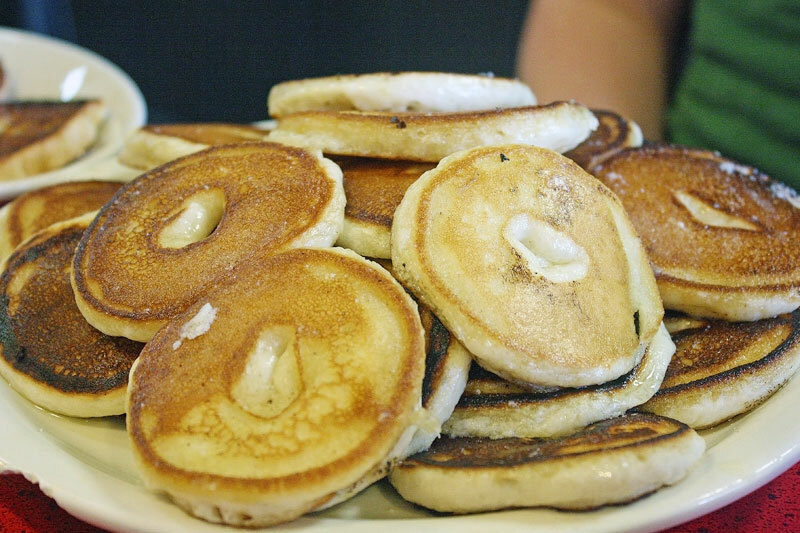 And these aren't just pancakes. They are literally little bites of heaven. They are more like little freshly fried doughnuts, soft and pillowy with oh-so-much butter. I've never had anything like it. And I never want to eat any other kind of pancakes ever again. 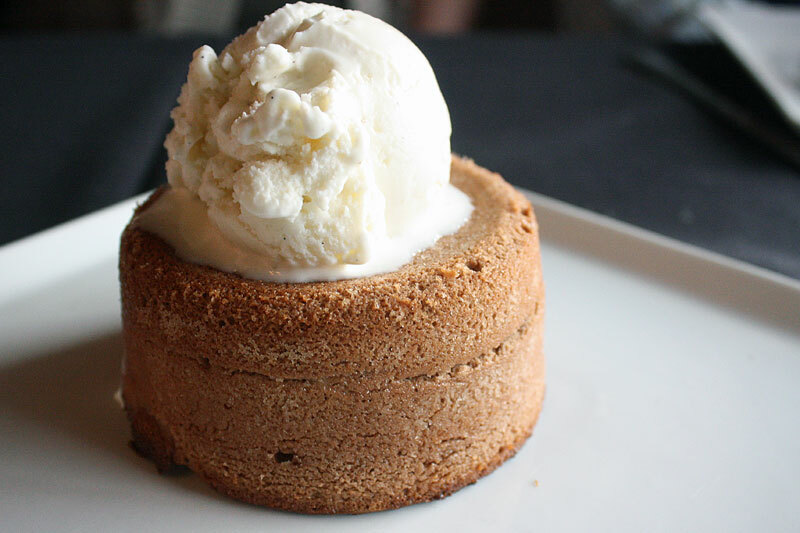 Seriously, this pancakes will change your life. 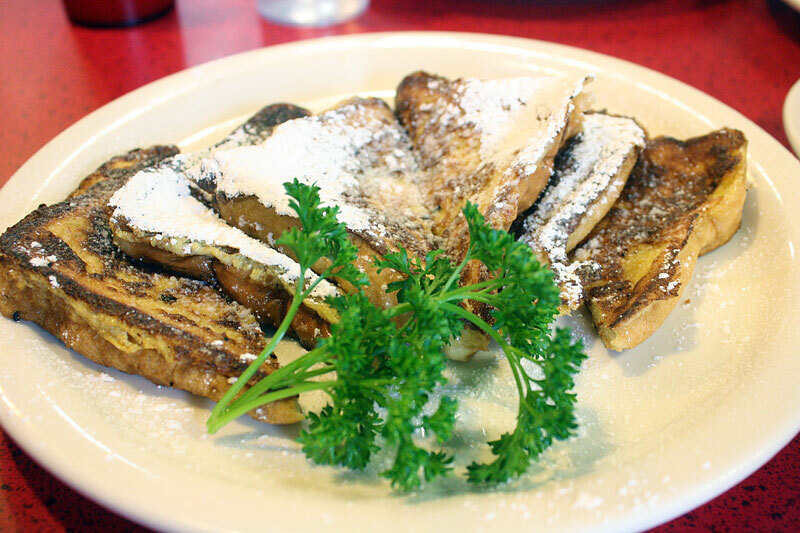 The other dishes here at Joe's Cafe were also delicious - perfect French toast, with more than enough to keep you full until dinnertime. 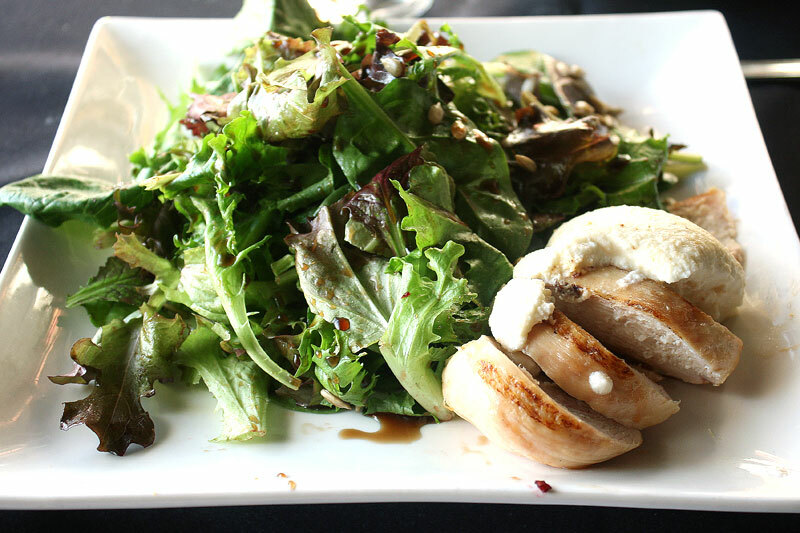 Not only is the food amazing at Joe's Cafe, but you couldn't ask for a more fun and friendly environment. When we went on a Thursday morning, Joe was the only one there, running the whole show. He makes you feel welcome with the kind of hospitality that only a true Southerner can provide. When I placed our order and got ready to pay, he said, "Nope - you aren't going to pay me until you are fully satisfied with your food!" By the end of our meal, we were begging to pay him! I was feeling a little adventurous, so I went with the steak and eggs. Incredible. Eggs were perfectly good, and the steak was deliciously seasoned and just the right amount of pink. The hash browns were good but not life-changing...if I were to get this again, I'd definitely go for the grits. Which we got with the omelets! Now these are no sissy omelets - they are stuffed to the brim with rich and flavorful ingredients, and could easily fill two people. And if they weren't delicious enough, they come with a side of either hash browns or grits, and I would definitely recommend the grits! Now, normally we've only ever had savory grits, usually with some salt and a little cheese or something. But apparently the demand for sweetness in Utah reigned supreme, and Joe now serves his grits sweet. They are like a creamier, smoother version of oatmeal with just the right amount of brown sugar and slow-cooked to perfection. There was a lady in there who told me she comes in at least once a week, just to order Joe's grits. I don't blame her! Definitely the best grits I've ever had. Ever. In addition to not being the biggest grits fan (before this meal, obviously), I also used to hate biscuits and gravy. They just seemed so fatty and gross that I was never really interested. All thanks to this little dish above. Wow. I never knew biscuits and gravy could be so gratifying. 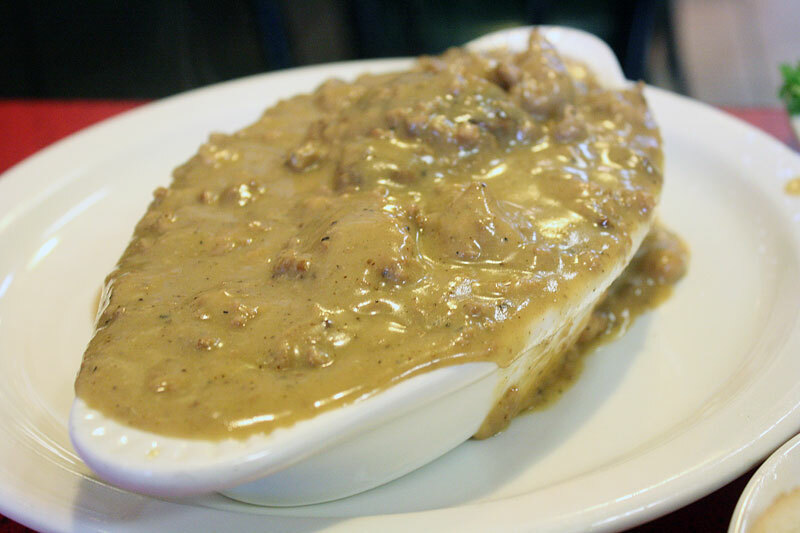 There is so much spicy and savory sausage in the gravy, plenty of pepper, at least a whole stick of butter, and some of the most tasty biscuits I've ever had in this little ceramic boat of goodness. 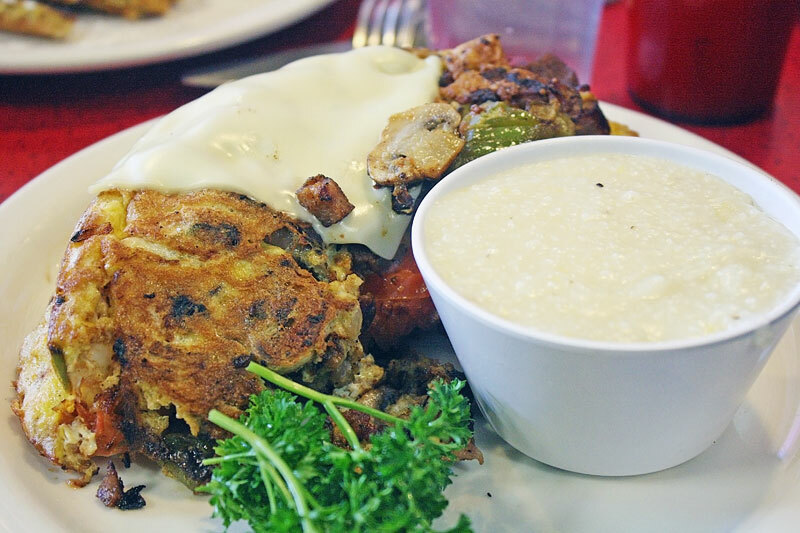 Of all the dishes we had here, I would say that the biscuits and gravy surpassed my expectations the most. And I wish certainly be having them again! 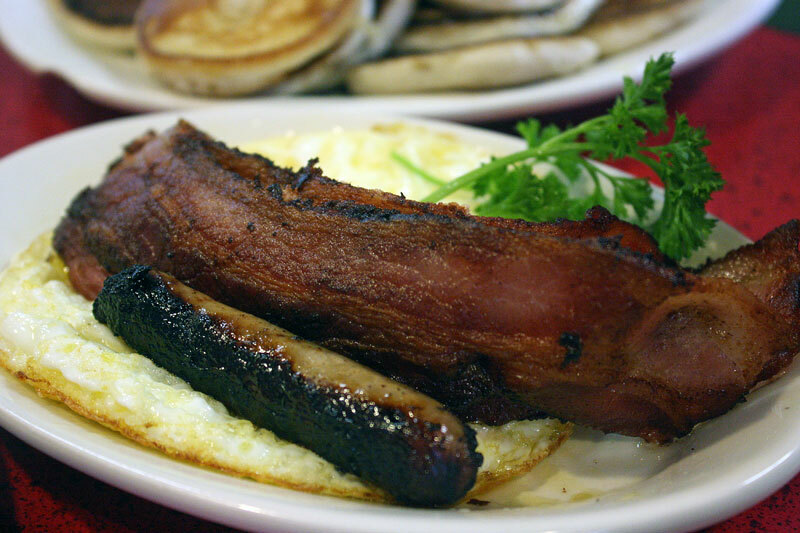 Here's the side of meat and eggs - Joe was feeling extra friendly so he gave us both the sausage and bacon. This my friends is real bacon - thickly sliced, seasoned with pepper...it just tasted more...bacon-y. Like bacon on steroids. So so so good. 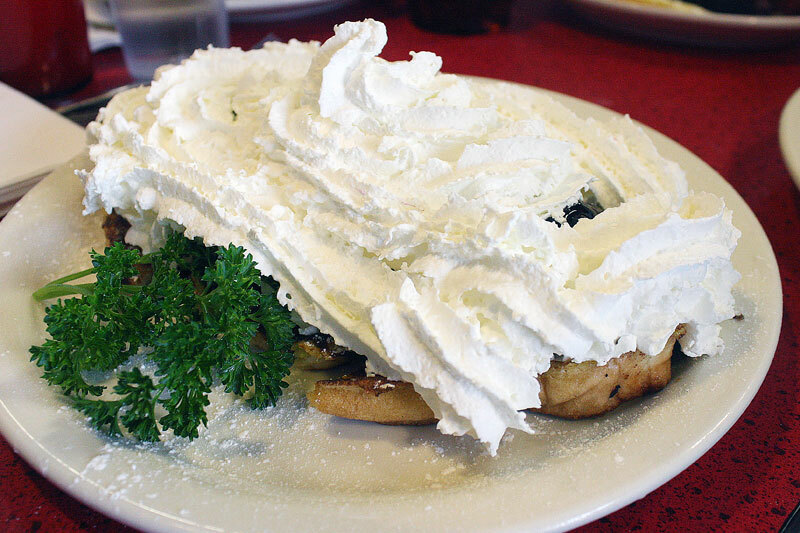 And if you'd believe it, there is some French Toast under there too. There is nothing skimpy or light about these meals - just delicious Southern cooking with all the butter you ever could want. Rich, scrumptious, filling, flavorful, and unique. I really don't know if I could ever eat breakfast somewhere else again. 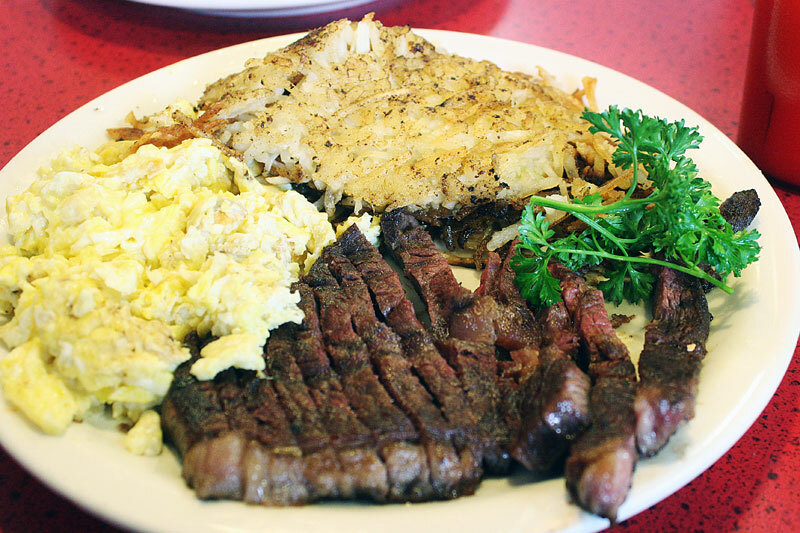 What You Should Do: Skip the pathetic plates served at Denny's and IHOP, and get yourself down to Joe's Cafe right now! This is without a doubt the best breakfast served in Utah, and it's served with a smile and soul music. Joe also does lunch, which I am sure is equally amazing - you can order either breakfast or lunch items at any time when he's open. I've never met anyone who hasn't had an incredible experience here, and you'll wonder how it's remained such a secret for so long! Go Go GO! I've been wanting to try The Copper Onion for forever, but it never seemed to work out with our schedules, so I decided to settle for going here for lunch last week instead. Normally I don't love trying new restaurants just for their lunch menu since they typically all have a similar boring spread of soup/sandwiches/salads, but The Copper Onion still proved to have something to interest my palate. They weren't too busy for lunch on a Friday afternoon, so we were seated immediately. Despite the dreary rainy weather, the restaurant was bathed in lovely natural light from their large windows and we loved the rustic decor. Michelle wasn't feeling too hungry, so she ordered a couple small plates, and I decided that I would have to go for a sandwich. My rule for restaurants is that I will only order something I cannot (or am not willing to) make at home, and a French Dip sandwich seemed to fit that bill. We tested the dumplings first, which turned out to be more satisfying than I had anticipated. They had a soft, tender texture, a delicate infusion of thyme, and were lightly fried. I was surprised at how they were filling, but still didn't feel too heavy. 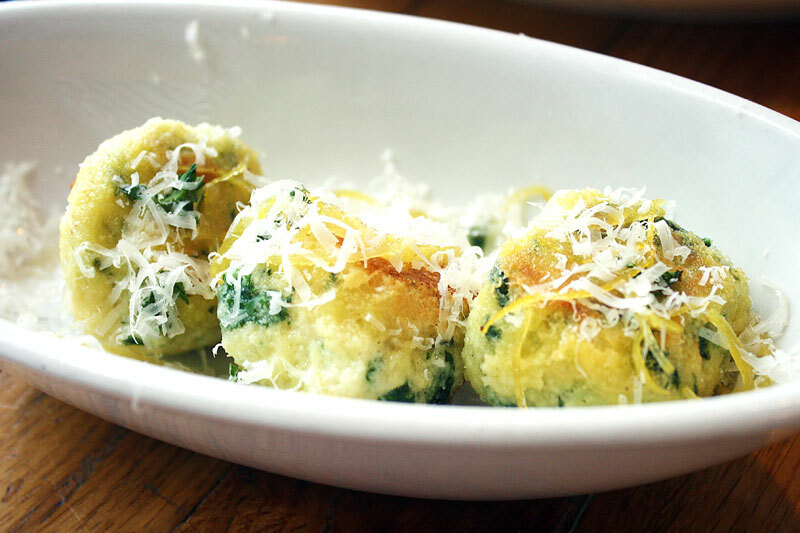 They were dusted with a light sprinkling of cheese and lemon, and are an excellent choice to start your meal. 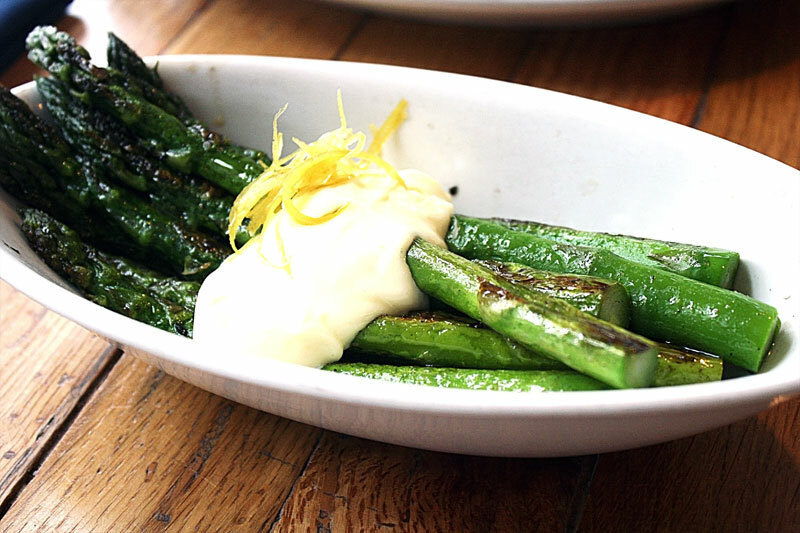 Lemon seemed to be the accent of choice in our meal, and was paired with a delicious creamy sauce for the grilled asparagus. The asparagus was cooked to perfection, helping eliminate the sometimes bitter taste that accompanies this vegetable. 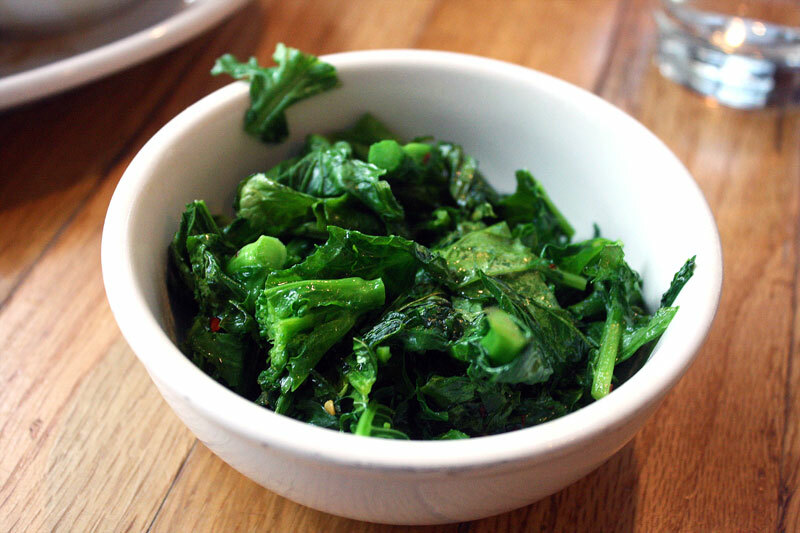 I ordered the broccoli raab as a side dish for my sandwich - let's start off by saying that this is clearly a different vegetable than broccoli! In fact, broccoli raab (or rabe or rapini) is not related to broccoli at all, and actually tasted to me more like a mix between kale and spinach. Either way, it was delicious, and was sprinkled with hot chili flakes that kept catching me by surprise! And now the real part of the meal - the French Dip sandwich. I was initially intrigued by this dish because it said on the menu that it came with Tillamook cheddar cheese. 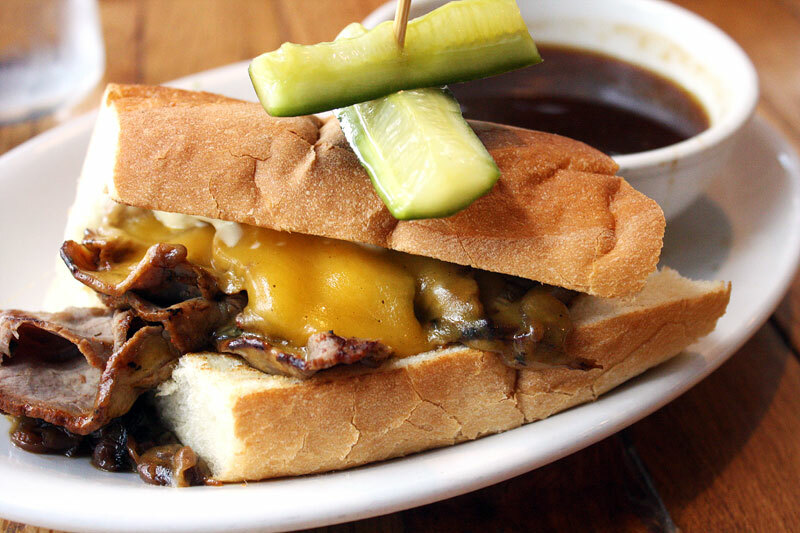 I've never had a French Dip sandwich with any kind of cheese except the rare provolone slices, but since I'm from the West coast, I am a die-hard Tillamook fan, and knew it had to be amazing. Fortunately, I was totally right. The rich cheese oozed onto piles of delicious roast beef from Pleasant Creek Ranch, and was highlighted by sweet grilled onions. The meat was a little dry, but in that soft, tender, cured way that is absolutely delicious. It was served with more than twice the amount of au jous I needed, and was topped with two of their housemade pickles. I am a huge pickle snob - I'll only eat Farman's pickles which sadly can only be found in Federal Way, WA now, but these pickles may have changed my mind. Fantastic. The bread it was served on wasn't the best, but it was sturdy and fresh enough to provide an excellent base for the wonderful sandwich filling inside. Totally messy, but a real treat. What You Should Do: Do what I am going to do, and go ahead and make a reservation for dinner! To me, they proved to be worth all they hype, and I will definitely be going back again. I am particularly intrigued by their wide range of fresh cheeses, and enjoyed the unique flavor twists on their dishes. The service wasn't particularly great, and it's definitely not cheap, but I would say it's certainly worth a trip for a special occasion and delicious meal. As some of you may recall, during the early days of my site I previously wrote a fairly scathing review for the Awful Waffle when it first opened. I felt like they were still trying to work out the kinks and I didn't really get the whole waffle craze. But after many protests from loyal waffle fans and friends, and my revelatory experience at Bruges, I decided to go back and give them another try. I remember that last time I felt like I was overwhelmed by all of the choices for toppings that I ended up ordering too many toppings and it just didn't work very well. So this time we decided to keep things a little simpler, which was a great choice. 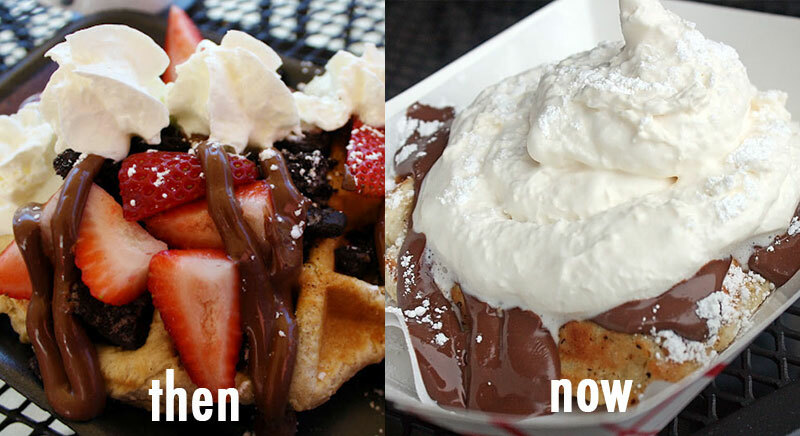 You can see from the picture above the difference in the amount of toppings that they used to give compared to now - before I complained that they hardly gave any syrup at all, but since they have been in operation for a while it looks like they have made a delicious change for the better. Though I think I still prefer the taste of the waffles at Bruges in Salt Lake, I do have to commend Awful Waffle for their great variety of options. Any topping you can think of, they have it. And unlike Bruges, they also now have the choice of a Brussels or Liège style waffle, in addition to gratifying savory crêpes. I'm particularly fond of the locally-sourced Grandma Nellie's Old-Fashioned Cream Syrup that I've never had anywhere else - it is less overpowering and thicker than normal syrup, and is absolutely amazing. They've also changed from the styrofoam plates that drove me crazy before to these cardboard boats which are much easier to eat from. The crêpes do sometimes stick to the boat itself, but they are much better. 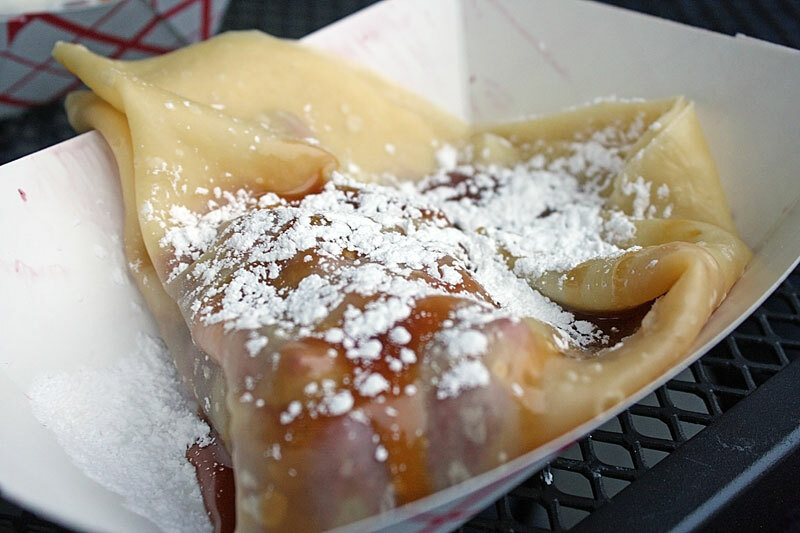 We also loved how the egg crêpe was served in a convenient foil wrapping, which would be great for BYU students who are looking for a quick tasty lunch near campus on the go. I like I definitely prefer savory crêpes to sweet crêpes - this one contained plenty of cheese, well-prepared eggs, and flavorful spicy sausage. What You Should Do: Definitely go. They have made a ton of improvements since first opening, and have so many different choices that you'll never get bored. I love the addition of the savory crêpes, and want to try the barbecue chicken one next time I go - I've heard it's phenomenal! Also, for those of you who are concerned - I do not have a personal vendetta against the owners of Dave & Cranky Chuckie's. I just did not enjoy the meal I was served. Yes the photos make the food seem appealing, but as I am sure we all know, just because something looks good doesn't mean it tastes good (see McDonald's commercials for examples). I was completely honest in the review, and don't feel like I need to sugarcoat anything just because other people disagree. However, I am sure I will be back there again some time, and hopefully, like the Awful Waffle, they will prove me wrong and I can get some of that food that everyone else seems to love! Like the probably 7,000 other classmates I graduated with a couple weeks ago, I wanted to go somewhere nice for dinner after graduation. I originally wanted to take my family to Communal, but with everything going on during graduation week, I totally forgot to make the reservation ahead of time, and they were all booked when I called two nights before. So I decided to go somewhere kind of new and quirky instead - Dave & Cranky Chuckie's. On their website, they claim to be a "tastefully abrasive American bistro," and if there are any words that describe my mother, it would probably be "tastefully abrasive." It sounded like a perfect match to me, so after our tushes regained consciousness from the lengthy ordeal commonly known as commencement, we headed down there. We were seated near a window, which was great lighting for my shots but also partially blinded me & Owen during the meal. This was mainly my fault - the staff offered to close the blinds, but I just couldn't say no to all that natural light, so our server offered his sunglasses to me, which was a very kind gesture. Little did he know that wearing any form of glasses (even normal ones) really throws off my depth perception, so I had to take them off after clearly missing my mouth with the abnormally tall glasses of water. 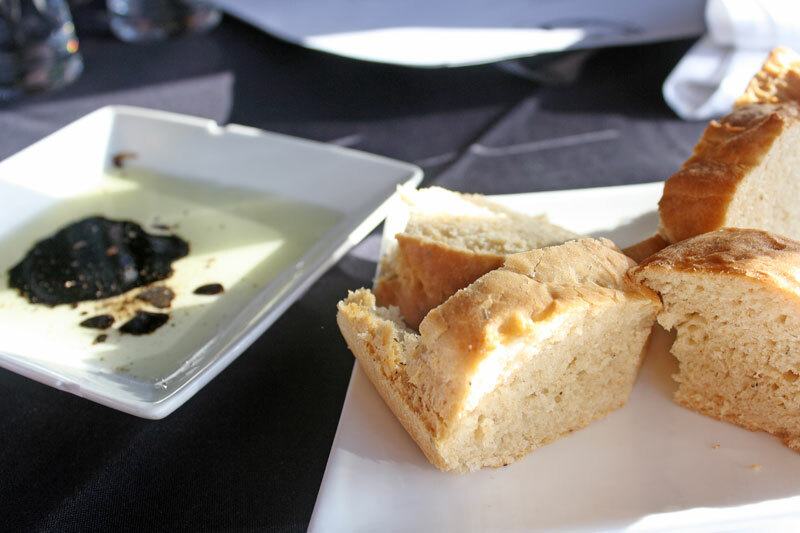 We were served some bread to start off the meal - it was very soft and had a delicious hint of rosemary, but was a little awkward because they only gave us four pieces of bread for five people. 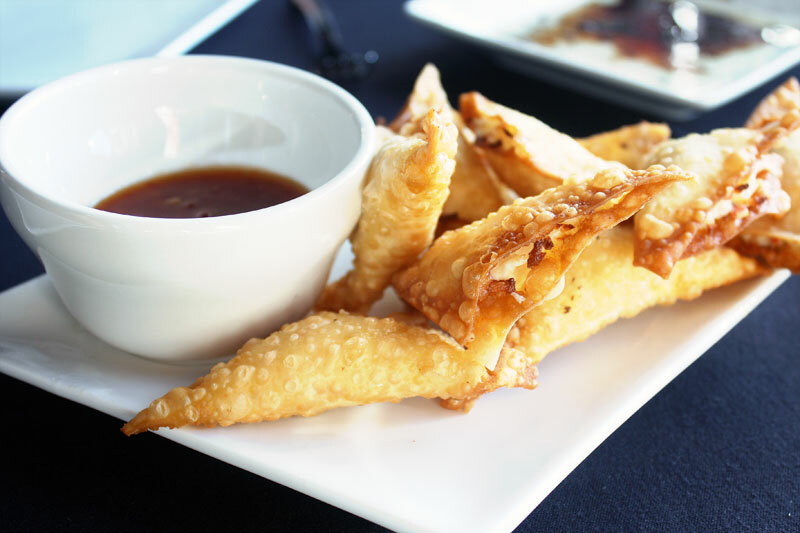 We ordered the stuffed wontons as an appetizer, which was probably my favorite dish throughout the whole meal. Though the interior content of the wontons was a little difficult to determine (perhaps some mixture containing fake crab meat, cream cheese and...? ), they were perfectly crispy and fried, and the sweet chili sauce it was served with was delectable. Since I'm a total pain, I forced my mother to get the ricotta chicken salad instead of the strawberry salad so we could have two different pictures and experiences. She's not the biggest ricotta fan (she hates it plain), so I tried to assure her that "ricotta chicken" probably meant that the chicken was cooked with ricotta or maybe it was all mixed together in the salad or something. Nope. It was just a big old schlop of ricotta plopped right on top of a bland and unoriginal chicken breast. There was a good mix of greens, but for a person who doesn't even like ricotta that much, the whole dish was pretty disappointing. Though sunflower seeds may add another thing to your list of ingredients, they do not contribute much flavor or color, and since my mother discarded most of the plain ricotta on the side, I ended up snagging it to give my own meal a little more textural and flavor variety. 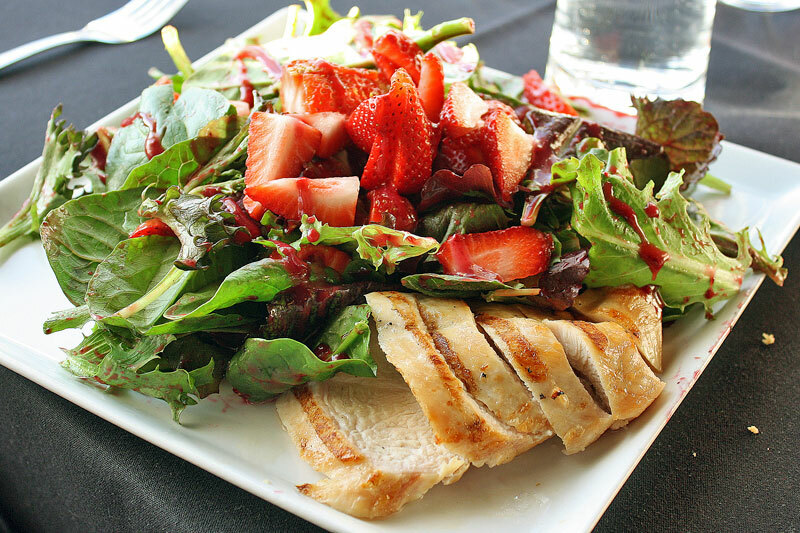 My grandma ordered the strawberry balsamic chicken salad and thought that it was great. It pretty much had the exact same formula as the ricotta salad - same mixture of greens, same humdrum sliced chicken breast on the side, similar type of dressing, but with some strawberries in the mix instead. It was good, but not very imaginative or impressive. 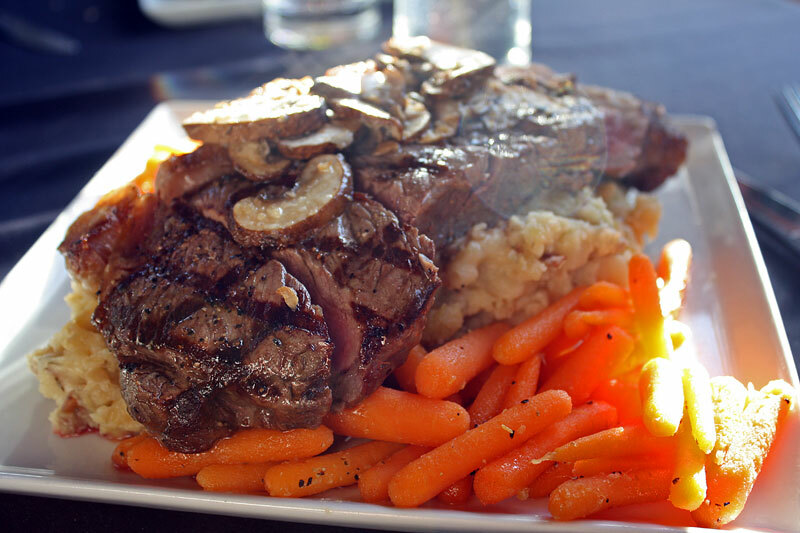 When our server, Paul, brought out Owen's steak, we were all pretty blown away. None of us had ever seen a New York strip steak that was so large before! Though the presentation was fantastic and those little grill marks on the steak looked straight from Gourmet magazine, the steak itself was a bit of a disappointment. 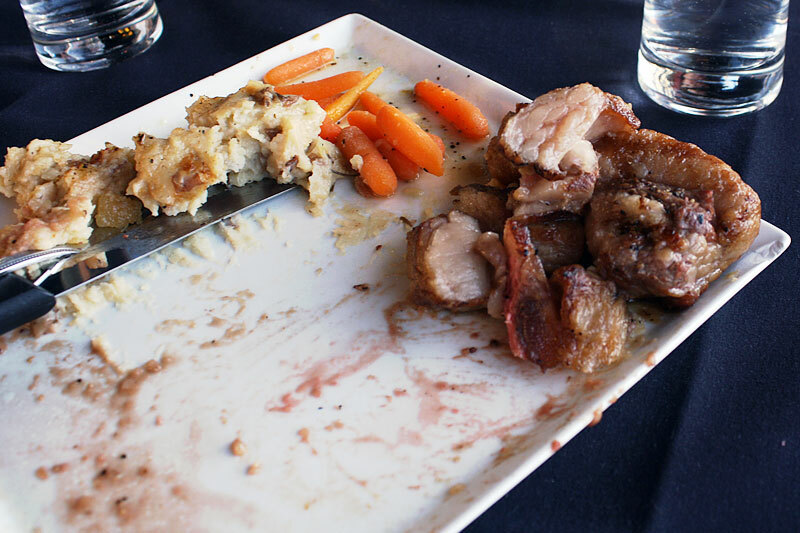 It was a little too tough and dry for me, and we realized it wasn't really all that much meat by the time Owen finished because of the huge pile of inedible fat that remained on his plate. Easily a third of the steak was this unpalatable blubber, which detracted from its original appeal. The mashed potatoes tasted good with some steak juice seeping into them, and the carrots were fine - a little al dente with plenty of pepper to keep Owen happy. 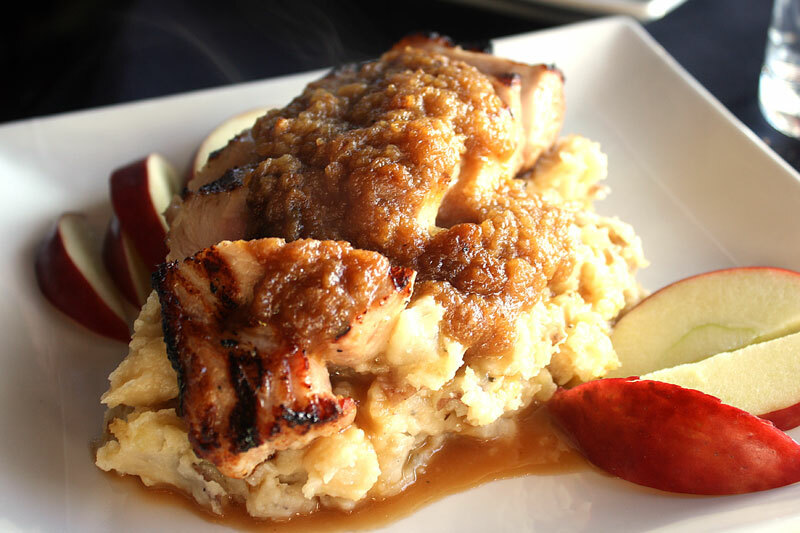 The pork loin was hit and miss for my family - Devynne really enjoyed the applesauce served on top of the grilled pork, even though it was an unappetizing shade of brown mush, but my mother craved for the salty and amazing flavor that can only be brought out of pork through brining. The potatoes were the same as the ones served with the steak, though they seemed less flavorful without the steak juices on top. Finally - my apple braised chicken. Now, I have to make a confession. Since it was finally the end of my undergraduate career, I was experiencing a bit of PSISF (post-stress immune system failure). Okay, I just made that up, but I had a bit of a cold when we visited this restaurant, which of course meant that my taste buds weren't quite up to their normal function. Luckily for me, I was dining with four other people who I greatly trust as far as taste buds go, so I figured it would still work out fine. When I started eating my chicken however, I was so confused. I thought maybe it was due to my congested nasal passage, but I could not taste one iota of apple on my supposedly "apple-braised" chicken. I asked our server what the deal was after everyone else had tried it and confirmed the absolute lack of apple flavor, and he said that the chicken is cooked with the apples and sometimes the flavor might not be absorbed into the chicken! How misleading! Basically it just tasted like an unseasoned chicken breast, remarkably similar to the chicken found on both salads, just with darker grill marks. 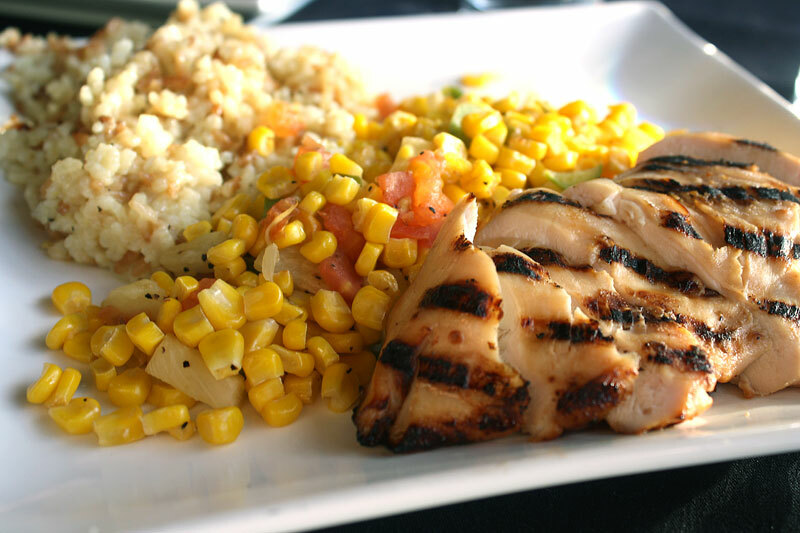 The succotash was alright - I liked the canned pineapple that was mixed in for some variety, and the risotto was definitely the best feature of any of our entrées. Though my mom referred to it as "fancy Rice-A-Roni," everyone kept trying to sneak bites off of my plate. Though we were all generally disappointed with our main courses, a good dessert can make up for the meal - at least in my family. We decided to go with the molten chocolate lava cake and the dessert special, which was a strawberry avocado shortcake. Apparently they bake all of their desserts to order, so we waited around for a good twenty more minutes for our final course to arrive. 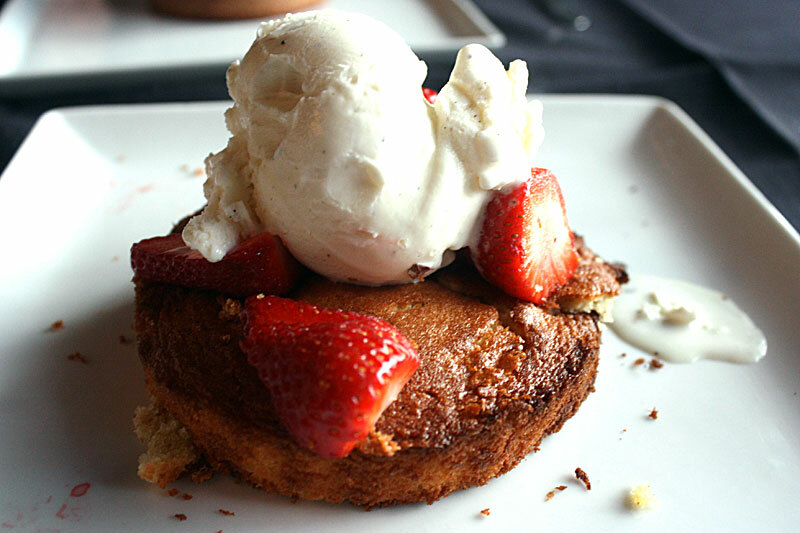 The first thing you may notice about this strawberry shortcake is that there are clearly no avocados involved. I asked the girl filling our water cups if the avocado was infused into the cake or something, but she said, "Oh...they must have ran out of avocados..." and then continued to avoid eye contact and our table the rest of the meal. Both desserts were exceptionally dry, surprisingly cold considering the fact that they had just been cooked, and horrifically bland. In my family, we pretty much love sugar so much that we will eat any kind of dessert, no matter how bad it is. These two desserts were the rare exception. The strawberry no-avocado shortcake was desiccant and crumbly, and kind of burnt. The lava cake was...indescribable. I wish I had taken a picture of the "lava" that was inside for you, but we were all dying from laughter by this point in the meal because of how shockingly bad the desserts were. The cake and lava inside were both this weird shade of greyish brown, which made us question its true identity as something that was supposedly made of chocolate. The lava itself was oddly thick and didn't exactly flow out of the cake - it was like your aunt's bad fudge that she brings around at Christmastime and forces you to eat. Except we couldn't eat it. Paul was really nice throughout the whole meal and must have realized by the end of it that we were not exactly enjoying the food. Now, if there is one thing that this restaurant knows how to do right, it is working the social media. When you get two young students running a restaurant with a bunch of their friends, they are definitely going to use the web to their advantage. They even have their own restaurant blog, Tastefully Abrasive, where they recently have started to scope out the competition in Utah Valley. As I was taking pictures of the food, Paul told us that we should write a review on Urbanspoon and post the pictures. Then my not-so-subtle mother broke my number one rule about reviewing restaurants, and told him that I have a restaurant website. This of course probably affected our service, but unfortunately did not improve the quality of the food. At the end of the meal, Paul came over and said that since I had a cold, I should come by and try them again and slipped me this card, which would give me 15% off the meal. What You Should Do: At the steep price of around $20 a person, I have to say that I do not recommend Dave & Cranky Chuckie's. Personally, I think I am going to give them a few months to become a more established operation, and maybe I'll try them for lunch or something instead. The whole experience seemed like some amateur friends who wanted to play a game of "let's run a restaurant," and the food was nearly all either unoriginal, under seasoned, or prepared in a strange and insipid manner. And just please do not get the desserts. 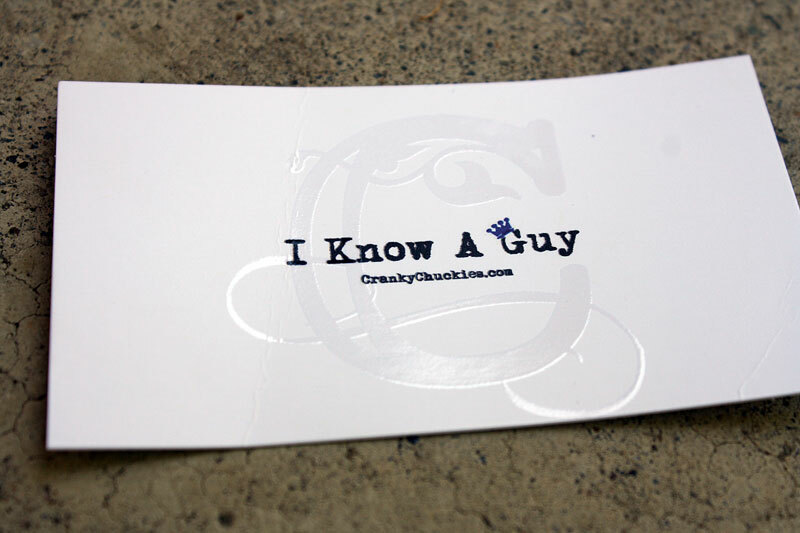 I know you are probably thinking, "Chelsey! 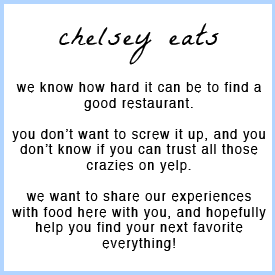 How can you insult a restaurant that apparently 97 other people in Provo like enough to go on Urbanspoon and rate it?" 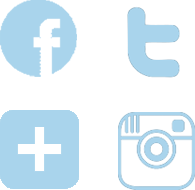 But as I mentioned before, these guys do have the upper hand as far as social media is concerned and I am sure that many of their friends are trying to support their restaurant venture. Your mother always taught you that you can't trust everything you read - unless it's on my website of course. Just kidding. You can either take my word for it and save yourself from an expensive and dissatisfying meal, or you can go there and let me know what you think! As we were on our way to see The Avengers at University Mall, I finally remembered to give this cupcake place a try! 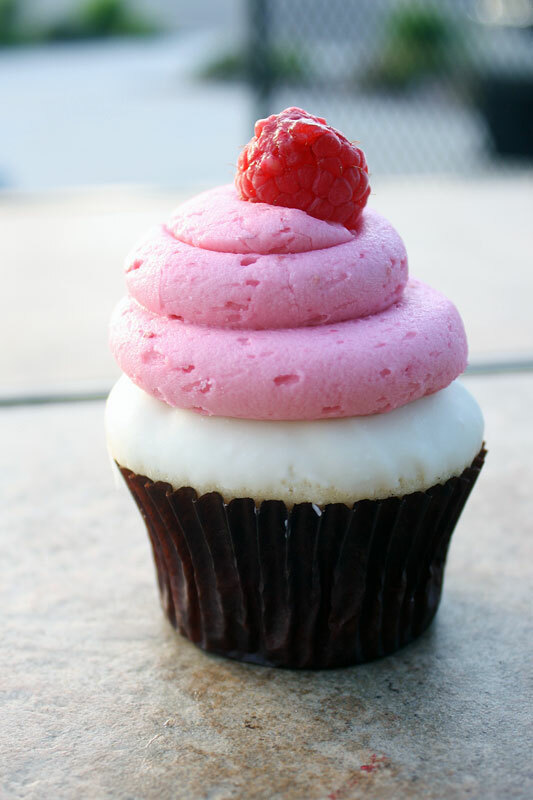 One thing I loved about Cupcake Chic was that since it is in kind of a hidden location, there was no wait and they still had tons of flavor options available. Though I still think The Cocoa Bean has my favorite cupcake, they seem to always run out of basically all of the flavors except vanilla and the "Better than Whatever" before 8 p.m. every time we go. So if you want to get a cupcake after dinner rather than before like a normal person, then Cupcake Chic is a fantastic place to go! We ordered three cupcakes, and then I saw a little sign on their cupcake display that if you check in on Facebook, you can get a free mini cupcake! So naturally we did that, and for 3 and a half cupcakes, I think $8 is a pretty good deal here in Provo! I was pleasantly surprised at how much we actually enjoyed the cupcakes. The cupcakes are a bit more dense than other ones I've had, but I enjoyed the rich flavor and liked how it supported all of the loads of delicious frosting. 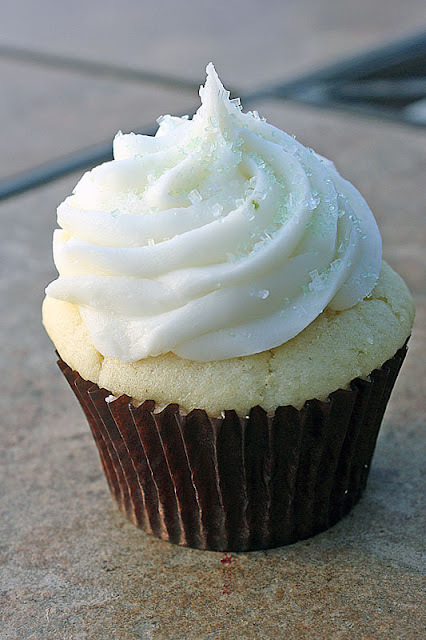 I think my favorite cupcake of all was the key lime pie cupcake - I'm a huge key lime pie fan, and this one had excellent flavor and a fun graham cracker crust on the bottom of the cupcake. 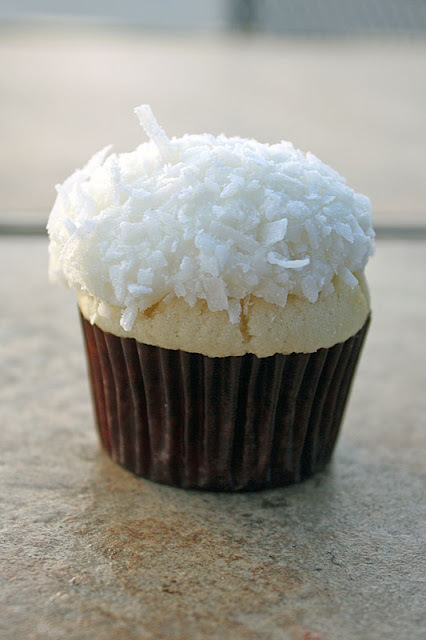 We chose the coconut flavor for our free mini cupcake, which was light and scrumptious, and we also loved the little candycane in the strawberry lemonade cupcake. 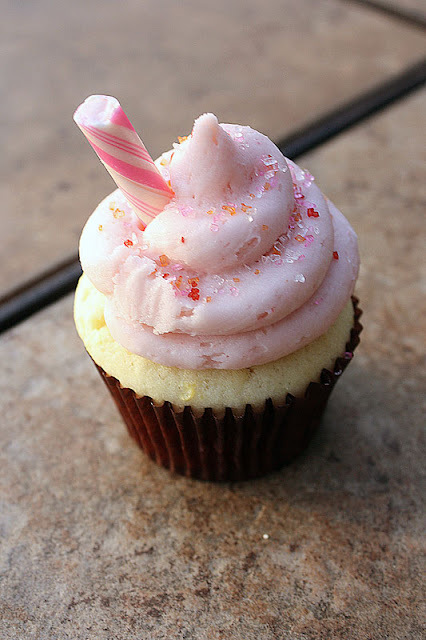 What You Should Do: If you're in the mood for a cupcake and the Cocoa Bean only has vanilla left, I would definitely recommend making the quick trip up to Cupcake Chic! They have a great range of flavors, sweet and delectable frosting, great customer service, and you can even get a free mini cupcake - it really doesn't get much better than that. So this lunch kind of happened on accident - a Target trip gone too long and an appointment up in Sandy meant that I needed to find a quick lunch place for us on the way up north. I was scouring my brain for restaurants along the way that I wanted to try, and I remembered Milagros from all of my trips to Winco (the best grocery store of all time)! They have a little sign outside one of their windows that says "To Go" or something along those lines, so I figured they could be pretty fast. We got inside the restaurant and I was surprised to discover that it was not just a to-go kind of restaurant, but rather a sit-down restaurant with a server and everything. We decided to go for it anyway, giving our server the heads-up that we needed to be in and out as fast as possible. Our server ended up being fantastic - really fast with our food, being friendly despite all of our crazy demands, splitting up the checks no problem...plus, as my grandma described, "he had the most beautiful blue eyes," which can't hurt either, right? :) We loved the interior decor - full of tons of live plants and great high ceilings. Also, their cups were pretty awesome. 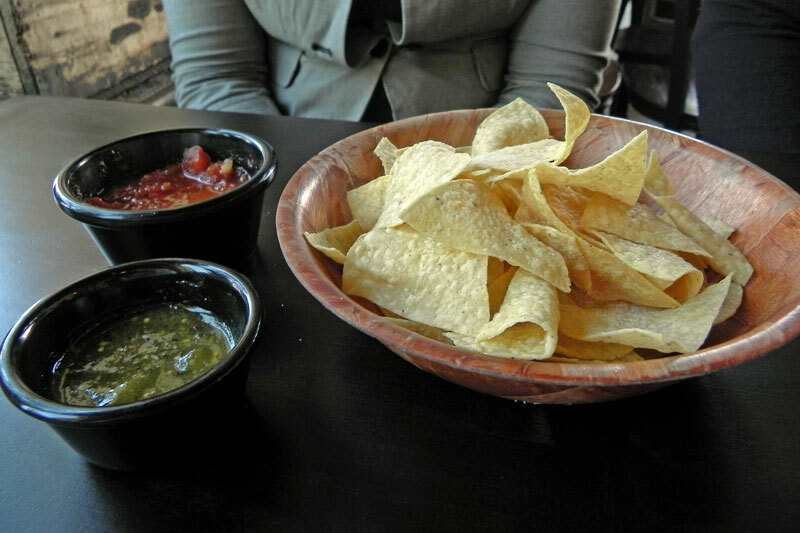 Like basically every Mexican place out there, we started with chips and salsa. And let me tell you, after this chips & salsa combo, I was pretty much terrified for our meal. Both salsas were awful - they were equally over-sweet and tasted straight from a jar of...really horrible salsa. Some people have complained that they don't bring you out chips and salsa every 30 seconds, but honestly, we really didn't want much to do with that so it was fine with us. We were all crossing our fingers as we waited for the rest of our food to arrive, praying for it to at least be edible. Fortunately, we were greatly surprised! Our meals arrived, and not only were they large enough to more than fill us, but they were absolutely delicious! 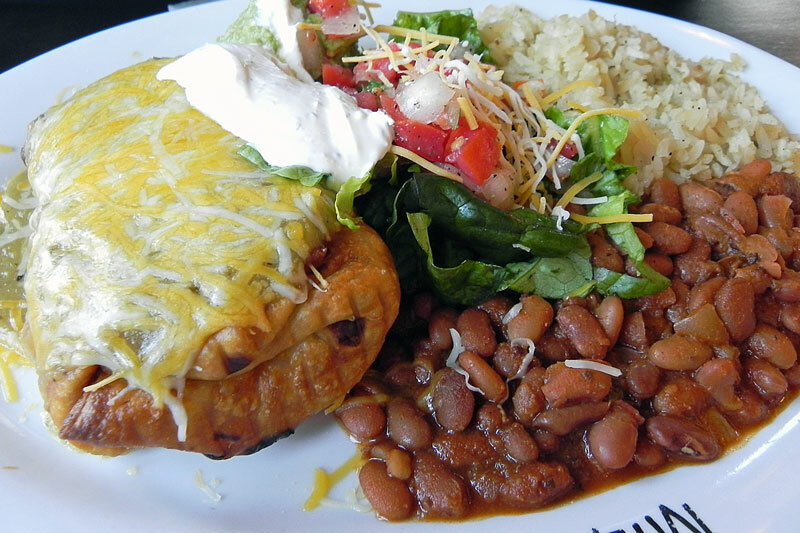 My mom got the chimichanga, which was perfectly fried and filled with tasty meat and cheese - not just cheap rice and beans. She loved the sweet rice, and found the beans to be a great complement. My grandma got the pollo fundido, which was a chicken breast wrapped in a fried tortilla and served with a really creamy sauce - fantastic! There were so many flavors going on at once and it was certainly unique and wonderful. 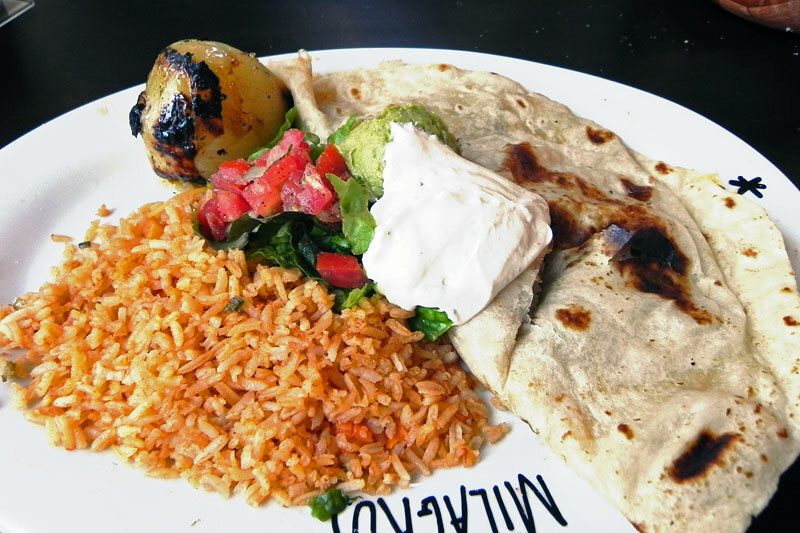 She loved how you could get the option of sautéed vegetables, a nice healthy option for usually sodium-heavy Mexican food. It came with a mix of zucchini, onions, and carrots. I absolutely loved my sweet chili chicken quesadilla. 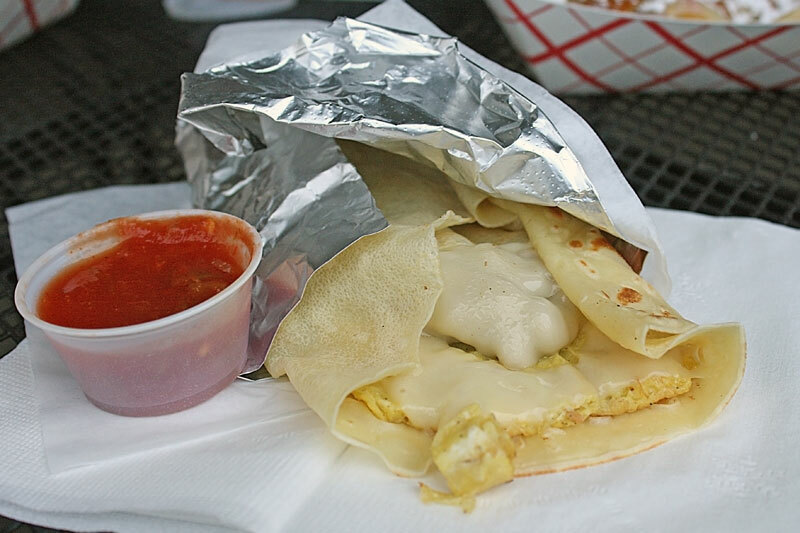 I think it may be my new favorite quesadilla, even higher than the pork quesadillas from Cafe Rio. Others have commented that the food is all very sweet, and this is true. So if you do not like sweet Mexican food (like the barbacoa pork from Cafe Rio), then I do not recommend this place to you. However, if you are a fan of delicious flavor (Psych, anyone?) and enjoy a little sweet touch to that Mexican spice, then this is the perfect place for you. Nothing in the meal was particularly spicy (including the "spicy" Spanish rice), but we all still enjoyed everything immensely. Finally, Devynne got the chicken mango salad, which like everything else, was amazing. 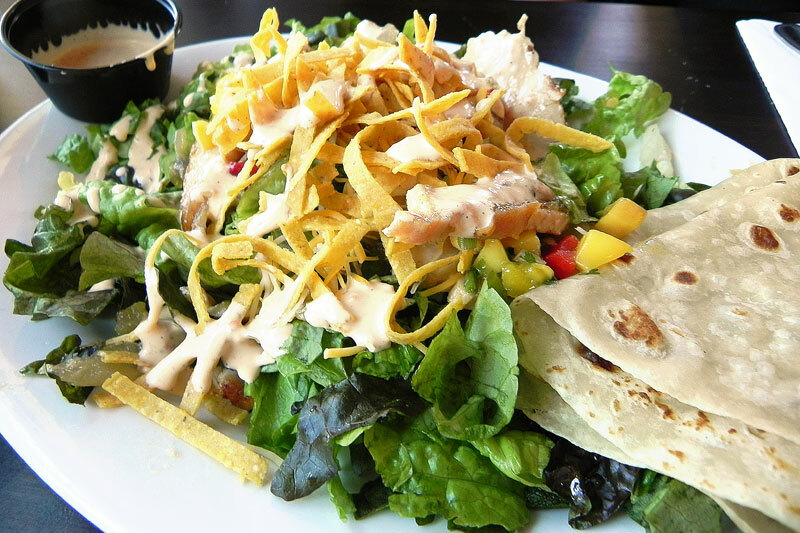 The chicken was moist, mango salsa mix was flavorful, and we loved the variety of mixed greens in the salad. It came with a freshly made tortilla, which wasn't quite as life-changing as the Cafe Rio ones, but still pretty high up on the list. What You Should Do: If you don't get immediately offended by the idea of a Mexican place that doesn't have great chips & salsa, then you should definitely check out Milagros. We loved their fresh mix of unique Mexican flavors, and it's a dream come true if you love sweet Mexican food as well. Their prices are a little high, but since two of us got the specials of the day, it ended up being a pretty good deal. 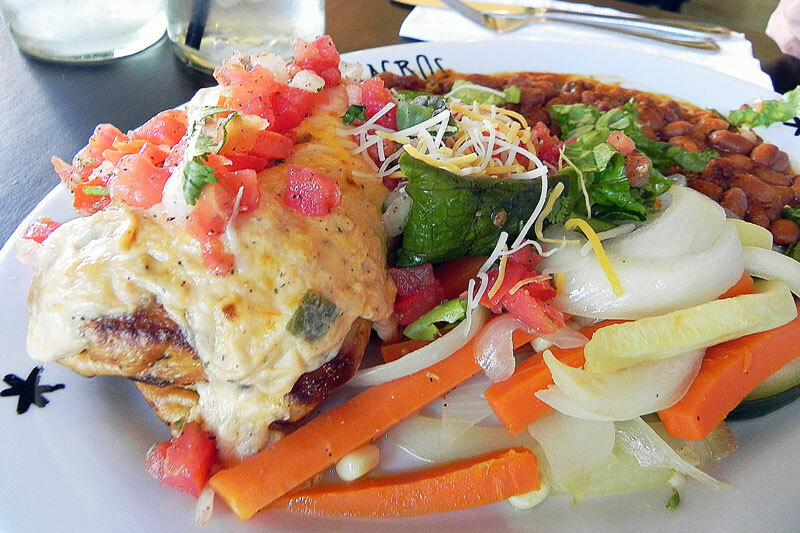 For a random quick lunch stop, Milagros is a great choice! As any BYU student who's trying to look cool and know stuff about "that other school up north" is aware, the Pie Pizzeria is where it's at. Located at this super shady place around the corner and down a narrow staircase, the Pie Pizzeria is one of the quintessential university hangouts near the U. Very grungy and pub-like inside, the brick walls are full of signatures and illustrations from people who have visited this pizza joint. Even my grandma left her mark! We got 2 of the second-largest size of pizza, which was completely unnecessary for six people because by the time we were full, there was practically a whole pizza left! I've always been a fan of the Pie, and our recent visit there did not disappoint! I'm especially hooked on their buffalo chicken ranch pizza - every other buffalo chicken pizza is pale and pathetic in comparison. 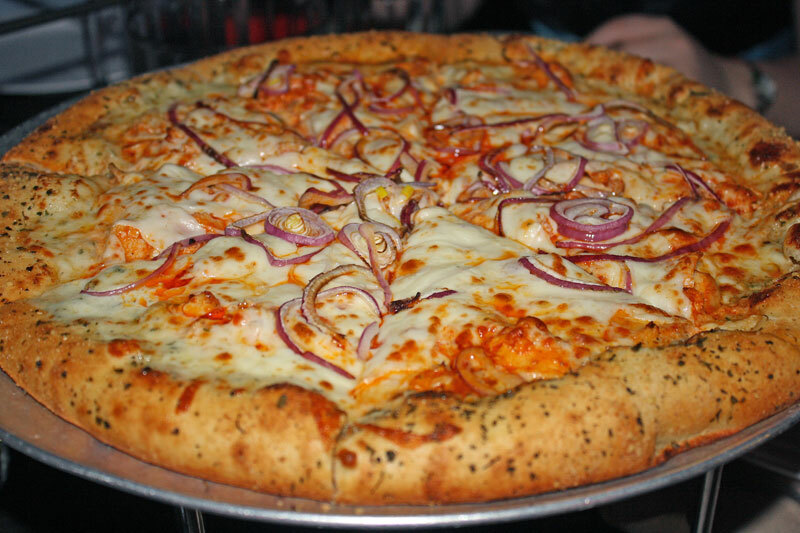 The slightly spicy sauce, thinly sliced red onions, and piles of delicious cheese make this pizza perfection. 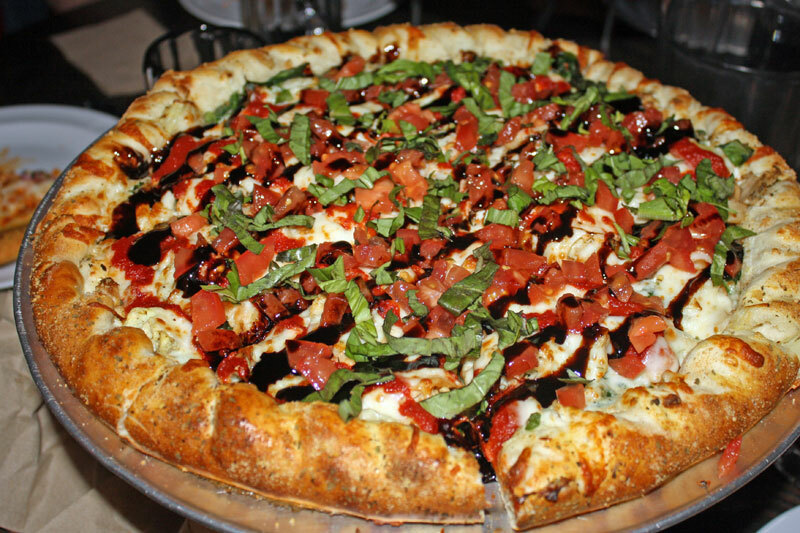 You don't go to the Pie Pizzeria looking for a healthy pizza option. Their pizzas are loaded with toppings and aim to satisfy. I love their thick and garlicky crust, and am impressed with how quickly they whip out these pizzas even though they are pretty much always busy.